I've been making this little ornament since 1972, when we moved to Sparks, NV. We moved into a brand new home, just a few days before Christmas, and didn't have our decorations yet. I had never liked the way the toe looked on any of the the patterns I'd seen, so came up with My version. Now 36 years later I'm sharing My Paperclip Ice Skate Ornament pattern with you. 2. I used Bernat Soft Boucle for the "cuff" on the pair in the photo. With the continuous wire of paper clip on bottom for blade and the larger loop to the right, attach yarn to paper clip with a slipstitch into the larger loop. Always crochet over the beginning tails. Row 1: Ch 2, 7 dc to end of paper clip (work first dc in the larger loop, work remain dc in smaller loop and around both wires). This row forms the foot of the skate. Row 2: Ch 2, turn, Dc in 4 sts. This row forms the ankle of the skate. Row 3: Ch 1 turn, sc in 4 sts. After last st, Ch 10, fasten off. On the second skate, only chain 8, so that the skates are offset after tying together. Row 4: Join fuzzy white yarn with a sc in turning chain of row 3. Sc in 3 sts, 2 sc in last st.
Fasten off and weave in ends. If you crocheted over the tails you will only have the ending tail of the trim to weave in. Repeat for the second skate and tie the two skates together with the tails of the ch 10 and ch 8. Adorable! And thank you for being so generous with your talent! Thank you very much. I made a set right away and am planning on making many more. Good for gift tags as well as ornaments! I remember those from years ago....thanks for sharing your pattern. 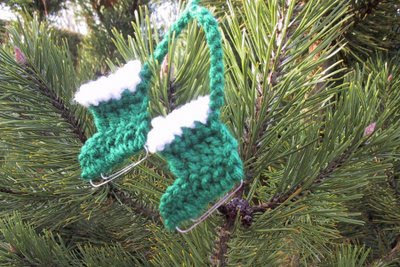 I am going to make one to put on my mom's little Christmas tree in her bedroom at the nursing home. I think your site is really cool. so many scarfs so many bags. Thank you! These made my Christmas gifts a little more special. I am going to use them as decoration for some of my packages. I want some of my family to have something special to hang on their tree next year. Again thank you, they are adorable. Thank You to the person who posted this I had been looking for this pattern! Love it and thank you....question,, I'm not sure about the direction you're going?? From the heel to the toe? Just do it! Then you will see. That said you will be starting at the toe. How great is that! I love hearing someone is teaching kids to crochet. Thank you so much for this pattern. My granny made these when I was a child and I have been wanting to find a pattern for these. Thank you! Thank you so much for sharing this cute pattern! I made tons of these and pasted them on paper to make holiday cards. What a good idea. May have to try that next Christmas. They could be tacked on with thread, so they could be easily removed. I can't tell you how wonderful you are for posting this pattern. I have been looking for it for years. Absolutely adorable, and so creative!!! Thank you so much!!! I just wanted to say thank you for this pattern. I love it and enjoy making them. I'd hug you if you were close enough! Too, cute! What a great little gift and a way to use up some of my stash!Thank you for sharing! Hello, may i translate it in french please? Yes, that will be okay. Please send me a link to the translation and I will add it to the blog post.